(Water Hemlock or Spotted Cowbane (Cicuta maculata) - 01) We spotted these water hemlock growing in a semi-wet area off the side of the road. 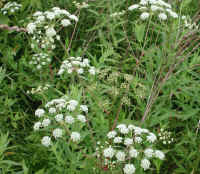 Water hemlock can grow to heights of three to six feet and usually grow in wet or damp fields or in swamps. 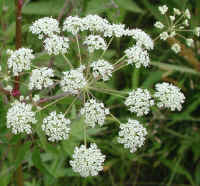 They are members of the Parsley family, Umbelliferae, or Carrot family, Apiaceae, depending on the reference consulted; but unlike the parsley and carrots we eat, this relative of the poison hemlock is probably the most poisonous plant in the United States. 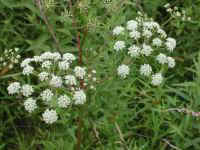 (Water Hemlock or Spotted Cowbane (Cicuta maculata) - 01a) At first glance, water hemlock may look like the common Queen Anne's lace, but the water hemlock's flat-topped umbel is separated. 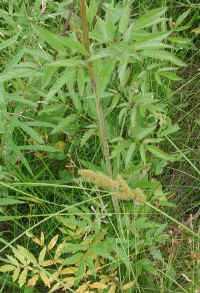 The name "cowbane" refers to the fact that this otherwise beautiful plant is just as deadly to cattle as it is to humans. 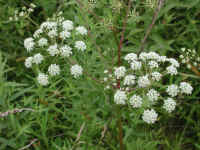 (Water Hemlock or Spotted Cowbane (Cicuta maculata) - 02) The most distinguishing feature of the water hemlock is the purple-streaked or spotted stems, hence the Latin name, maculata, which means blotched or spotted. 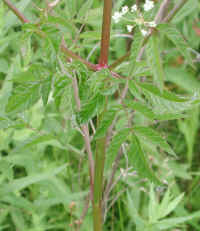 The alternately growing leaves of the water hemlock are pinnate with a terminal and two or three sets of parallel coarsely toothed leaflets. (Water Hemlock or Spotted Cowbane (Cicuta maculata) - 03) This is another view of the water hemlock leaf and stem. 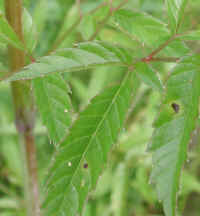 Beginning from the right of the photo, note the way the leaf is divided: it has a terminal leaflet, followed by a parallel set of single leaflets, and then it develops parallel side leaflets that are compounded with terminal and parallel side leaflets. (Water Hemlock or Spotted Cowbane (Cicuta maculata) - 03a) In this photo we have a closer look at one of the divided water hemlock leaflets. Note also the leaflet veining and the points at the end of each toothed section. (Water Hemlock or Spotted Cowbane (Cicuta maculata) - 04) This is another photo of a patch of water hemlock. 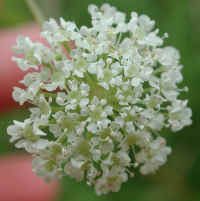 (Water Hemlock or Spotted Cowbane (Cicuta maculata) - 05) This is a closer look at one of the sections of the water hemlock's flowering umbel. (Water Hemlock or Spotted Cowbane (Cicuta maculata) - 06) This is another close up look at a single umbel section of the water hemlock flowers. 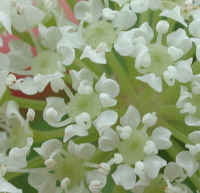 Each individual flower is less than 1/8 inch across. (Water Hemlock or Spotted Cowbane (Cicuta maculata) - 06a) In this bee's eye view of some of the water hemlock's tiny flowers, we can see that each flower has 5 petals, 5 stamens, which grow between each petal, and one pistil, which appears to consist of only the stigma without a style. (Water Hemlock or Spotted Cowbane (Cicuta maculata) - 07) This is another photo of the water hemlock stem and leaves, to help identify it from other plants in the field.